DESCRIPTION: Apefly (Spalgis epius) butterfly is one of the few butterflies whose caterpillars are carnivorous. The caterpillars feed on mealy bugs which infest plants. These mealy bugs are protected by ants. The female butterfly has to avoid these ants in order to oviposit successfully. The ants are very protective of the mealy bugs as they provide ants with honey dew. 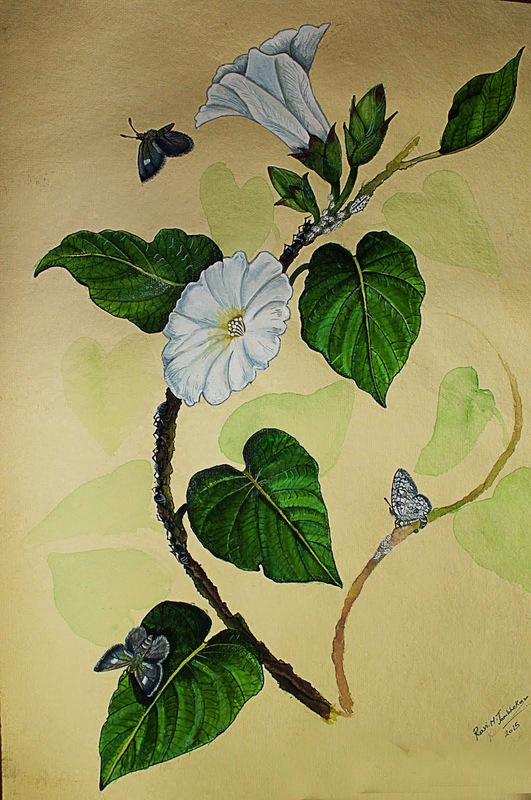 In this painting I describe these interactions where the mealy bugs are feeding on operculina turpethum under the protection of common black ants. Apefly female is laying eggs on mealy bug clusters.